This page has very large files to show you tiny details. Together with the bell recordings this makes it take a long time to load - but we think it's worth the wait! 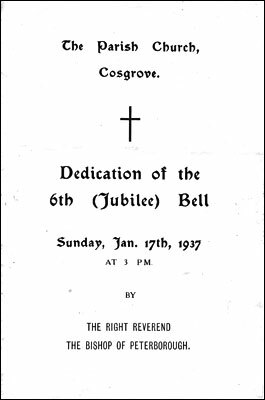 The Ringers and bells were clearly a highly regarded part of Cosgrove village life during the eighteenth century.. There were four official, national ringing days. King Charles II Restoration day was still being celebrated 150 years after the event. Gunpowder Treason Day, November 5th was still a national holiday and the bells were rung. The current monarch’s “Crownation” day was annually marked by ringing the bells and the actual Coronation day was marked by bells “by order”. 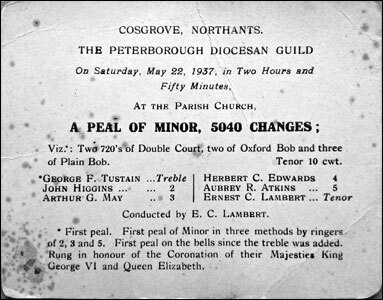 A midnight peal on Christmas Eve was also rung during this period although change ringing had only just been introduced. Other ringing took place when there was a special event to be notified or celebrated  “vicktorie” over the French in various skirmishes was an example. Weekly ringing on Sundays probably occurred but, as today, the Ringers were not paid for these. 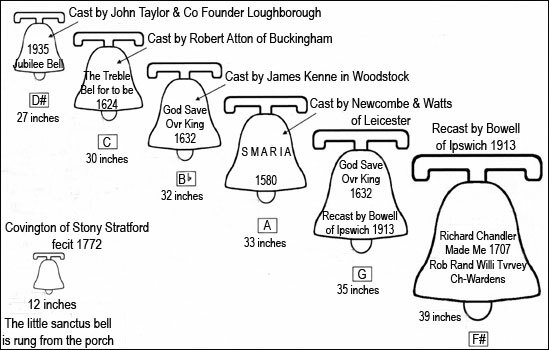 Maintaining the bells was a constant headache for the Cosgrove Churchwardens and Ringers. 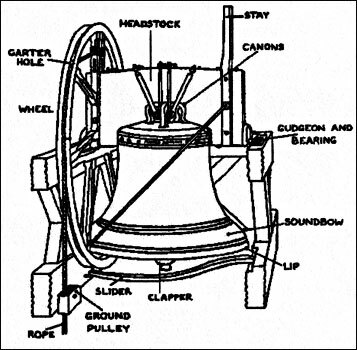 Bells had to be “oyled” regularly and components of the bells and frames needed much renewal. 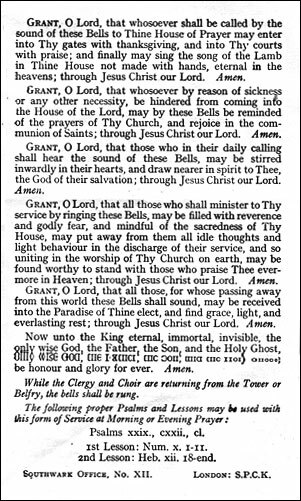 The story of the making of the Great Bell is revealed in the account for 1707 when the founder’s estimate is sought, the old bell taken to be recast and the new bell finally hauled up to the belfry again. Metals were weighed and accounted for by the pound, as were bell “Roopes”. In the days before lorries and cranes, haulage and “drawing” on carts were a significant cost. 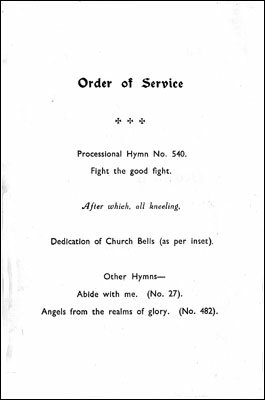 In the accounts, some terms are clearly specific to bells and their Ringers and not all are clear. What were “keys” and “ferrils”? Why were bell brasses “runed” or “rimmed”? We can read selected passages from the accounts below. 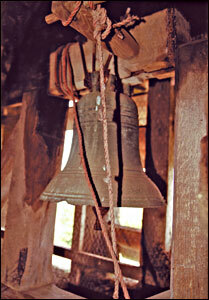 In the bell chamber, besides the five bells, there is what is termed a “call bell”. 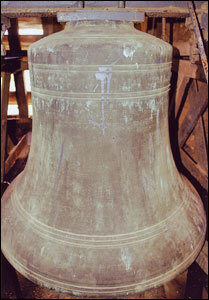 It may be the saints’ bell of 1754 and the sanctus bell of 1552. 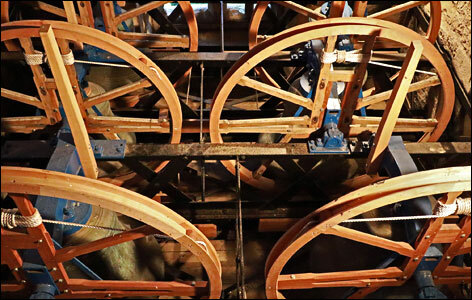 It is never rung because when the floor of the chamber was put in five holes were made for the ropes of the five large bells, but no hole was made for the rope of the small bell. It is likely, however, that this will soon be altered and its voice heard again. 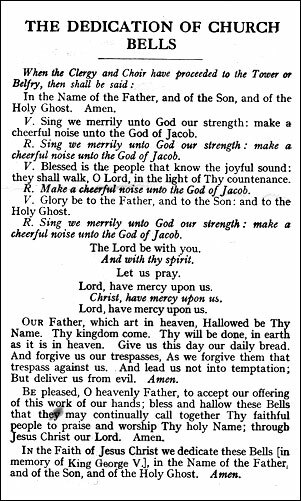 being some notes thereon complied & printed by the Reverend William Milner Atkinson, M.A., LL.B. Of the present bells the oldest is the 3rd. The date of it is unknown, but it is certainly earlier than 1550. 1. ROBERT ATTON MADE ME THE TREBLE BEL FOR TO BE 1624. 2. & 4. GOD SAVE OVR KING 1632. 5. RICHARD CHANDLER MADE ME 1707 ROB ROND WILLIAM TVRVET CHVRCHWARDENS. Spent when William Turvey went to bargain with Rich. 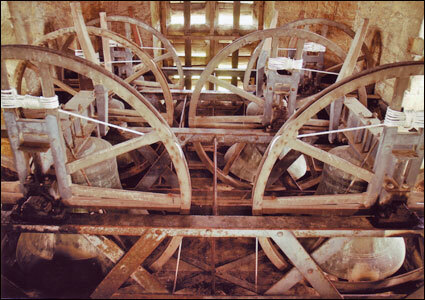 The brasses are the sockets in which the gudgeons or axles of the bells swing. Unfortunately Chandler's work has not proved satisfactory, the tenor being poor in tone ; and as it has now (1913) become necessary to re-hang the bells, it is proposed to take the opportunity to re-cast the tenor. 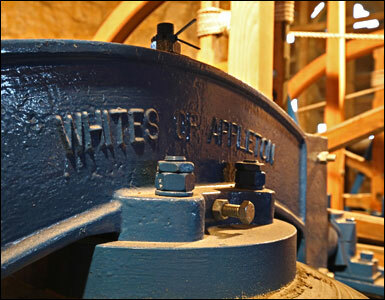 In 2018 White’s of Appleton completed the replacement of the bell hangings in Cosgrove tower. This work was paid for partly by a legacy from a ringer, Keith Aldridge, as well as grants and donations. The work, begun in 2017, was interrupted by the major reconstruction of the church roof, rendering the tower temporarily unsafe.